BEPS (Base Erosion and Profit Shifting) is a set of mechanisms used by large multinationals to take advantage of various tax breaks and low rates globally. In most cases, profits are either moved to or declared in advantageous locations in order to reduce the overall tax bill of a group of companies. BEPS is typically classified as tax planning that serve to migrate profits from higher tax jurisdictions to lower ones. Currently, the OECD (Organisation for Economic Co-operation and Development) are implementing new legislation in a bid to establish an industry standard when it comes to BEPS and what tax declarations companies are allowed to conduct. Since Ireland implemented its headline low corporation tax rate of 12.5% for an Irish Limited Company, it has become a prime English speaking European location for multinationals. In recent years, Ireland along with many other countries have strived for further control of BEPS (Base Erosion and Profit Shifting) mechanisms. Company Bureau has been ideally placed to respond to the growing need for Irish companies and provide support of this type of foreign direct investment in Ireland. Recent high-profile settlements, like Apple’s 13 billion tax payment in Ireland have raised led non-resident companies to scrutinise greater regulation that has been put in place in recent years. However, this has not removed Ireland’s commitment to the low corporation tax rate, a business-friendly environment and the possibility of reduced public declarations for some vehicles. The Irish government have gone to great lengths to ensure multinational businesses are still catered for and foreign direct investment continues to flow into the country. The Irish Government has put a ‘road map’ in place designed to increase regulation in a fair way while still remaining very competitive. In fact, global giant Facebook has continued to push ahead with large expansion plans in Ireland this Autumn by acquiring the AIB Bank Centre campus in central Dublin. Far from a negative sign, this step will quadruple the workforce the tech giant has on the ground in Ireland. With the separation of the UK from the European Union to take place in March 2019, Base Erosion and Profit Shifting has become a growing concern for many businesses. An Irish Limited Company represents a highly competitive tax vehicle with a strong connection to the European Single Market. The impact of Brexit will see the existing land connection present between the Republic of and Northern Ireland receive specific provisions in the leave deal. This provides a unique trading platform for business in Ireland. In addition, strong trade relations with China and the United States, Ireland is ideally placed to take advantage of some of the most profitable global markets available. Qualifying Investor Alternative Investment Funds (QIAIF) were created to counteract some of the bad press previous tax saving schemes in Ireland had obtained and to compete with other offshore jurisdictions. Each QIAIF will be subject to the below, once standard central bank conditions are met. Some QIAIF vehicles select the tax transparent Limited Partnership type. However, since their introduction in 2014 the Irish Collective Asset-management Vehicle (ICAV) has been the preferred choice for both US based or linked investors, outperforming options in several other jurisdictions. How will BEPS regulation effect Ireland? 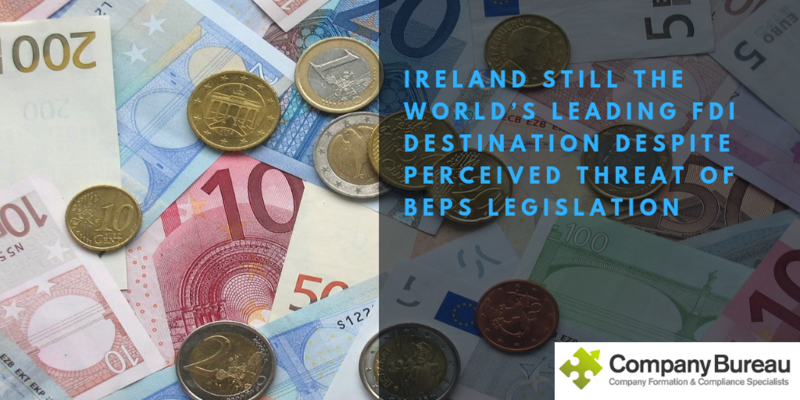 While the OECD are in the process of taking steps to regulate the use of BEPS mechanisms, especially in tax havens, Ireland remains one of the most tax transparent countries within the European Union. The Irish Government have consistently displayed their commitment to a firm ‘on-shore’ stance while providing tax incentives and breaks for non-resident companies. Given the level of regulation and data protection regulation in place, BEPS regulation will have little impact on Ireland’s attractiveness as a leading jurisdiction for inward investment. The above QIAIF schemes, strong talent base and overall low corporation tax rate serve to solidify Ireland’s position as a global hub for business. For more information on any of the above, BEPS, investing in an Irish Limited Company or specialist tax vehicles like the Irish Collective Asset-management Vehicle (ICAV), don’t hesitate to contact the Company Bureau team on cosec@companybureau.ie or call us on 01-6461625.